Hey guys! For today’s post, I put together a holiday gift guide for you! Much better than last year when I published my gift guide 2 days before Christmas! 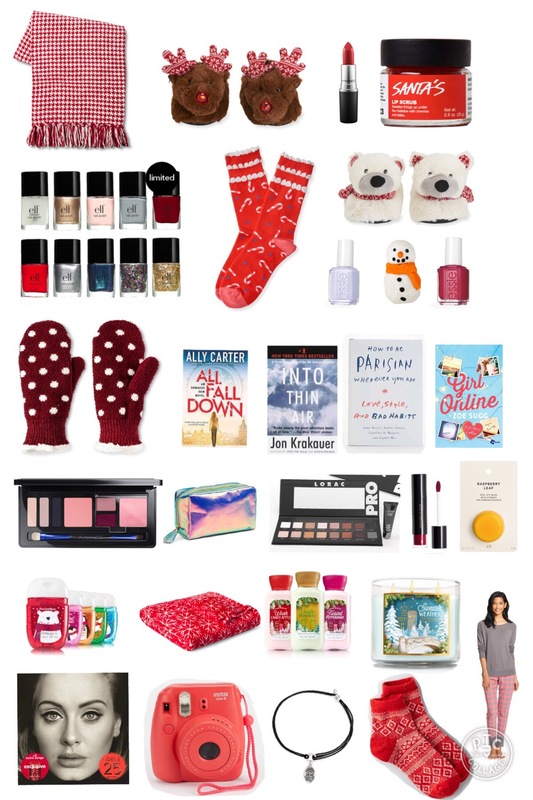 One downfall is that this year it’s not one-stop shopping at Target though 😉 Anyway, I scoured the Internet for 30 gifts for everyone – there’s books, cosmetics, slippers, and more – so I really hope you’re able to find something for someone on your list this year. All the products are listed below with a brief product description from me. Enjoy, and let me know in the comments if you find something you like or if this post was helpful to you! LED Reindeer Sleepers – Aeropostale ; I love these slippers because the nose lights up! Lipstick in Dare You – Mac Cosmetics ; Red Lipstick is perfect for this time of year! Santa’s Lip Scrub – Lush Cosmetics ; I’ve heard so much about this product and how great it is, so I thought I’d include it on my gift guide. Have any of you ever tried it? Polar Bear Slippers – Aeropostale ; Equally as cute as the reindeer slippers! Altitude Attitude Nail Polish – Essie ; I love a good berry color for winter! Snowman Fun moldable soap – Lush Cosmetics ; This is so cool – the soap arrives in a small tub of 4 different colors and you can mold it into any shape or snowman you want. Candy Cane Crew Socks – Aeropostale ; Socks are a great gift to keep warm this winter. 10 Piece Nail Polish Set – elf Cosmetics ; Every year, elf Cosmetics releases a holiday collection and nail polish cube. I always look forward to seeing the holiday collection! These colors are perfect for winter time. All Fall Down book – Target ; This book is by my favorite author, Ally Carter. It’s action-packed and will keep you on the edge of your seat. I definitely recommend it. Into Thin Air book – Target ; I read this book for school last month and I learned so much about Mount Everest (it’s the author’s personal account of his Mount Everest climb). If you’re looking for an interesting nonfiction read, this is it. How To be Parisian Wherever You Are book – Urban Outfitters ; The Internet loves this book. I’ve never read it, but I’d like to. Girl Online book – Target ; This book is about a girl who runs a secret blog so of course I loved it! Face Mask in Raspberry Leaf – H&M Beauty ; I used a face mask at the Blue Lagoon in Iceland, and I thought this might be good for a winter night-in. Lip Stain in Leading Lady – H&M Beauty ; Again with the berry colors – it’s a staple. Lorac Pro Eyeshadow Palette – Kohl’s ; My cousin has this palette and it’s so pretty. I would love to receive this, and I’m sure a lot of other girls would too! Holographic Makeup Bag – H&M Beauty ; You could fill this bag with some of the other cosmetics I’ve included and gift it to a friend, or you could fill it with other items and give it to someone. Either way, it’s a cute and personal gift! Enchanted Eve Face Palette/Cool – Mac Cosmetics ; This palette is multi-functional because it includes eyeshadows, lip colors, and blush. I love this and I’d love to receive this too! Holiday Traditions 5-Pack PocketBac Sanitizers – Bath & Body Works ; I look forward to seeing (& smelling!) the winter products from Bath & Body Works every year. This package comes with Winter Candy Apple, Twisted Peppermint, Vanilla Bean Noel, Jingle All The Way (my favorite! ), and Merry Cookie. Snowflake Throw Blanket – Target ; Festive and toasty! Holiday Traditions Body Lotion Trio – Bath & Body Works ; Again with the Bath & Body Works holiday collection. Lotion is is a necessity for winter and these scents are so nice. This lotion trio comes with Winter Candy Apple, Vanilla Bean Noel, and Twisted Peppermint. Xhilaration Pajama Set in Red Coral – Target ; Every year my mom gets my sister & I a pair of pajamas for the holidays, and this is the pair she gave me this year! I love them because they’re so comfy and soft, plus I love the plaid print pants. Fair Isle Ankle Socks – American Eagle ; As I said before, socks are a good gift that pretty much everyone loves, and this pair is a very festive fair isle print. Key To Life Kindred Cord Bracelet – Alex & Ani ; My Mimi gave me this bracelet for Hanukkah (we saw her over Thanksgiving so she gave it to me then). I really like the design on it, and I like that the bracelet is adjustable. Fujifilm Instax Mini 8 Instant Camera in Raspberry – Best Buy ; I’ve liked these cameras for awhile. Some of my friends have them and I think they’re really cool. They’re a bit on the pricier side for the items I’ve listed so far, but I think it’s a really nice gift. Adele “25” album – Target ; Oh, Adele. I love her new songs, and I expect that the rest of her album is just as good. I hope you enjoyed this post and that this gave you some gift ideas for someone! Thanks for reading, and I’ll talk to you tomorrow! P. S. I tried to do direct product links to all of the products but WordPress stopped me after doing x many so I couldn’t get that to work, sorry guys! Happy shopping!